FOR THE SAKE OF YOUR AND YOUR CHILDREN’s HEALTH, please call 011-49993555 if you find anyone burning leaves around your house on a regular basis. You ca also approach that person, explain her/him the health impacts (lung disorder and respiratory problems that reduce a person’s life span by many years) of leaf burning and suggest alternate measures (like composting or even dumping the leaves in a municipal bin). A complete ban on burning of leaves or any kind of waste or garbage in public spaces like parks and gardens has been around for quite some time now. However, its implementation has been wanting and maalis and other individuals have continued this habit of burning leaves after sweeping them on one corner. As a result, Delhi’s air gets even more polluted from leaf burning, an act which is not just illegal, but also harms each and every individual living in areas where leaf burning is rampant. With the air pollution in Delhi reaching sky high, and with Delhi becoming the most polluted city in the world, there is now visible enforcement of this ban and one can see hoardings, like above, around the National Capital announcing a heavy fine on anyone caught burning leaves in parks or public spaces. 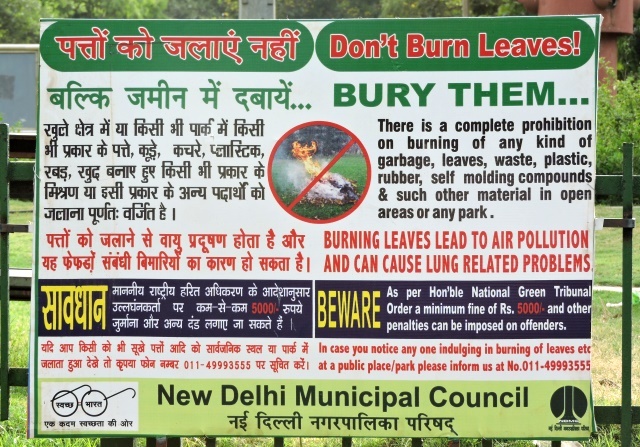 Every Delhiites if requested to not burn leaves…and more importantly…stop anyone around you (near your house, office, school, college, marketplace or anywhere) from burning leaves. Every additional bit of smoke is one day less from a Delhiites life in the present day.